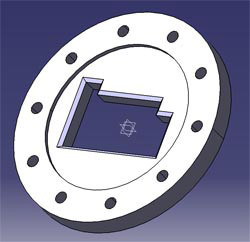 CAD model of the original extrusion plate. An extrusion plate frequently fractured. To develop an optimized geometry, the original plate was modeled in CAD (see right). 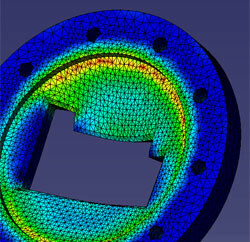 Finite-element analysis of the extrusion plate. Then the stress situation was analyzed which helped to obtain an improved geometry. The stress gradient was used as a criterion for mesh adaptivity. A tetrahedral mesh was used here.